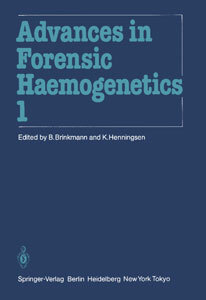 The first series of ISFH proceedings Advances in Forensic Haemogenetics Vols. 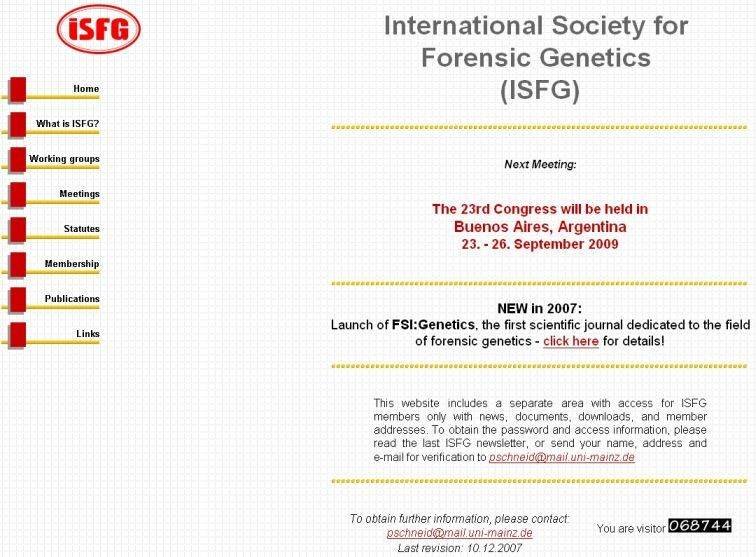 1 ­– 6, covering the international congresses in the years 1985-1995, have now been made available online for ISFG members. 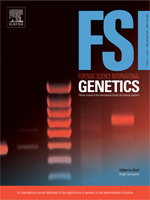 Please visit https://www.isfg.org/Publications/Advances in Forensic Haemogenetics and sign in as a member to get the tables of contents for all six volumes! 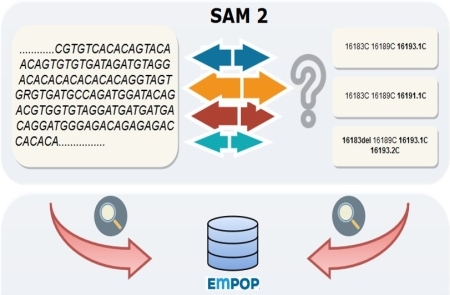 We are happy to announce the development and launch of the new search engine SAM2, https://empop.online; (Huber et al 2018: "Next generation database search algorithm for forensic mitogenome analyses"; http://dx.doi.org/10.1016/j.fsigen.2018.09.001). SAM2 performs database searches in unaligned nucleotide string format and provides phylogenetic alignment and haplogroup estimates of mitotypes. Elsevier, the publisher of our journal "Forensic Science International: Genetics" has just released information from Clarivate Analytics that the impact factor for 2017 has jumped from 3.911 to an unprecedented 5.637, the highest value ever obtained by a forensic journal in this field! The details are shown in the figure above and document the excellent quality of our journal. FSI Genetics continues to be the leading journal in the category "Medicine, Legal". Furthermore, FSI Genetics now ranks at position 21 among 171 journals in the category "Genetics" which is also quite extraordinary! A new volume of the FSI:Genetics Supplement series containing extended abstracts for work presented at the 27th International ISFG Congress in Seoul 2017 is now available. The link was placed on our Publications page under Congress Proceedings. These articles are free of charge for all. More than 35 plenary lectures and workshop presentations given at the 27th International ISFG Congress in Seoul 2017 have been uploaded to our website and made available to the ISFG members. Please visit our Education page in the Members' Area for viewing and downloading. Please note that you will have to sign in with user name and password to have access to the page! The scientific prize of the ISFG 2017 has been awarded to Professor Manfred Kayser from Erasmus University Medical Center Rotterdam. The award was announced during the 27th International ISFG Congress in Seoul. Manfred Kayser receives the award for his groundbreaking work related to forensic DNA phenotyping and haploid markers. He will give the inaugural lecture in 2019 at the 28th International ISFG Congress in Prague. The 27th International ISFG Congress in Seoul, South Korea, has started on August 29th 2017. More than 540 abstracts have ben submitted, and approx. 700 participants from more than 65 countries are present. The Local Organizing Committee has done an excellent job to ensure a smooth organization of this conference taking place in the large COEX centre. For further details, see http://www.isfg2017.org. The ISFG congress 2017 is going digital: a mobile app has been created by the organizing committee to keep track of the schedule, and to allow live questions from the auditorium after the oral presentations! The ISFG DNA Commission has published guidelines and recommendations on the use of X-STR markers. Linkage and linkage disequilibrium (association of alleles) are of special importance for such evaluations and these concepts and the implications for likelihood calculations are described in more detail. Furthermore it is important to use appropriate computer software that accounts for linkage and linkage disequilibrium among loci, as well as for mutations. The document can be retrieved from the ISFG DNA Commission publication list. The EU Horizon 2020 funded VISAGE Project was launched with its kick-off meeting on May 30/31 2017 at the Erasmus University Medical Center Rotterdam, The Netherlands. The VISible Attributes Through GEnomics (VISAGE) Consortium will establish new scientific knowledge, develop prototype tools, validate and implement them into forensic practice, to predict a person’s appearance, age, and ancestry from DNA traces. The outcome will help focusing police investigations to find unknown perpetrators more rapidly and effectively via DNA-based intelligence information obtained from crime scenes. This guide shares what DNA analysis can currently do in the criminal justice system, what its limitations are, and what might be possible in the future. It includes graphics and real-life cases where DNA evidence has been a game changer in investigations as well as where its misuse has led to miscarriages of justice. The authors hope this guide will be a useful resource to anyone who works with, or crosses paths with DNA evidence in the criminal justice system. The ISFG DNA Commission has published Recommendations on the validation of software programs performing biostatistical calculations for forensic genetics applications. Recommendations for the software provider address, for example, the documentation of the underlying models used by the software, validation data expectations, version control, implementation and training support, as well as continuity and user notifications. For the internal validations the recommendations include: creating a validation plan, requirements for the range of samples to be tested, Standard Operating Procedure development, and internal laboratory training and education. To ensure that all laboratories have access to a wide range of samples for validation and training purposes the ISFG DNA commission encourages collaborative studies and public repositories of STR typing results. The document can be retrieved from the ISFG DNA Commission publication list. FSI: Genetics offers the option to buy "Open Access" for published articles, to make them freely available to both subscribers and the wider public. There is a 20% discount off the open access publication fee for members of the ISFG. For furter details, see the open access information for authors. You can identify yourself as a society member during the article submission process by providing your ISFG membership number (displayed on your personal profile page). The presentations of the 26th ISFG congress have been published in Vol. 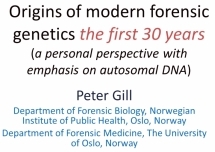 5 of the Forensic Science International: Genetics Supplement Series. The proceedings are now available free of charge due to funding by the congress organizers and the ISFG. You find links to all previously published congress proceedings here: Publications/Congress Proceedings. 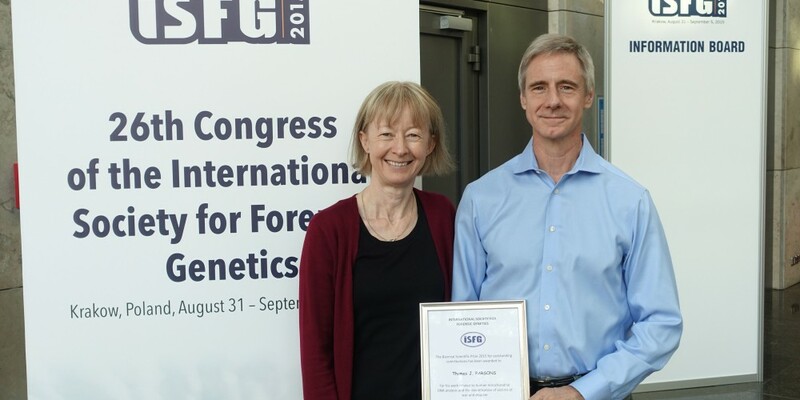 At the 26th ISFG Congress in Kraków in September 2015, the Scientific Prize of ISFG 2015 was awarded to Dr. Thomas J. Parsons. He is the Director of the Forensic Science Department of the International Commission of Missing Persons (ICMP). 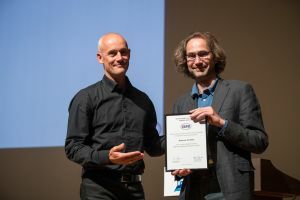 He received the award from the ISFG President, Dr. Mecki Prinz, for his work related to human mitochondrial DNA analysis and the identification of victims of war and disaster. During the 26th ISFG Congress in Kraków, Poland, the General Assembly has elected Walther Parson (Innsbruck) as the new president of the society. Also, John Butler (Gaithersburg, MD) was elected as new Representative of the Working Parties, and Leonor Gusmão (Rio de Janeiro) was reelected as Treasurer of the ISFG. 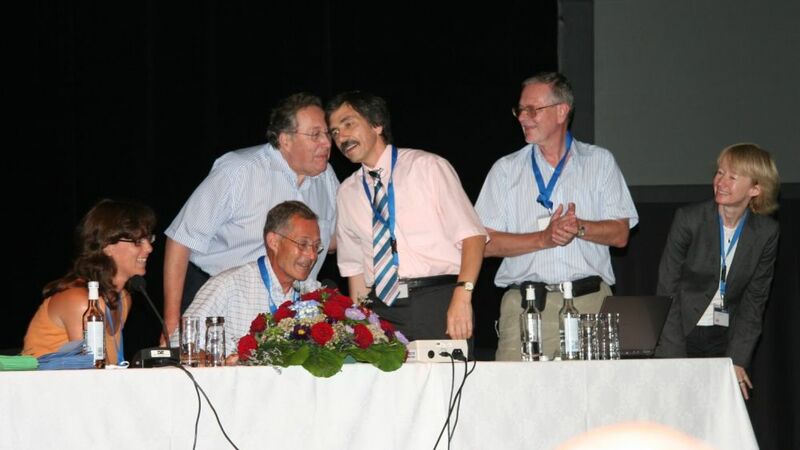 Furthermore, the Assembly decided that Wolfgang R. Mayr (Vienna), the former secretary of the ISFG, and president of the two ISFG congresses in Vienna 1987 and 2011, as well as George Sensabaugh (Berkeley, CA), the president of the ISFG congress 1999 in San Francisco, will become Honorary Members of the ISFG. As venue for the 28th ISFG Congress in 2019, the city of Prague (Czech Republic) was elected by the members of the assembly. A new page describing the International Society for Forensic Genetics has been created and recently accepted in the popular WIKIPEDIA Encyclopedia. Furthermore, the category Forensic Genetics has been established under Forensics to link all relevant pages for this topic. All ISFG members and users familiar with creating and editing Wikipedia pages are kindly invited to connect additional relevant pages and to scrutinize the quality and content of all Wikipedia pages related to this category. 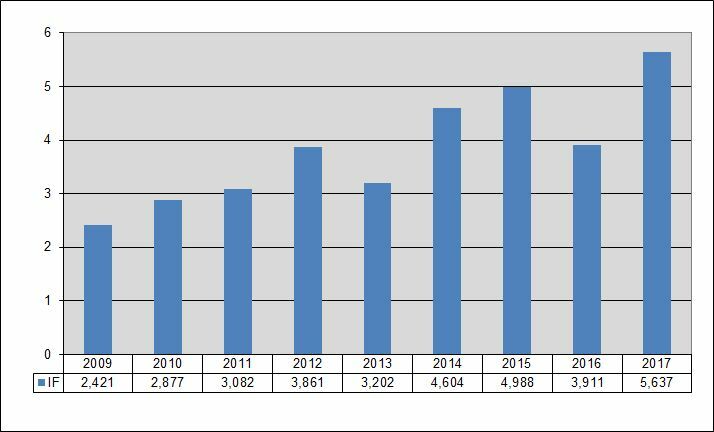 Elsevier, the publisher of our journal "Forensic Science International: Genetics" has just released information from Thomson Reuters that the impact factor for 2014 has jumped from 3.202 to an unprecedented 4.604, the highest value ever obtained by a forensic journal in this field! The details are shown in the figure above and document the excellent quality of our journal. FSI Genetics is again the leading journal in the category "Medicine, Legal". Furthermore, FSI Genetics now ranks at position 33 among 157 journals in the category "Genetics" which is quite extraordinary! Professor Konrad Hummel has passed away on December 30th, 2014, at the age of 91. He was the last living founding member of the ISFG. Konrad Hummel was a highly recognized scientist in particular in the German-speaking countries due to his contributions in the field of population genetics and biostatistics for paternity and relationship testing at a time when such cases could only be analyzed using blood group serology and protein polymorphisms. In the 1960ies, he collaborated with the statistician Peter Ihm for developing a general algorithm for kinship analysis. However, his concept of using equal prior probabilities to "simplify" the Essen-Möller formula that helped to standardize paternity calculations in many European countries was also critically commented by fellow scientists. 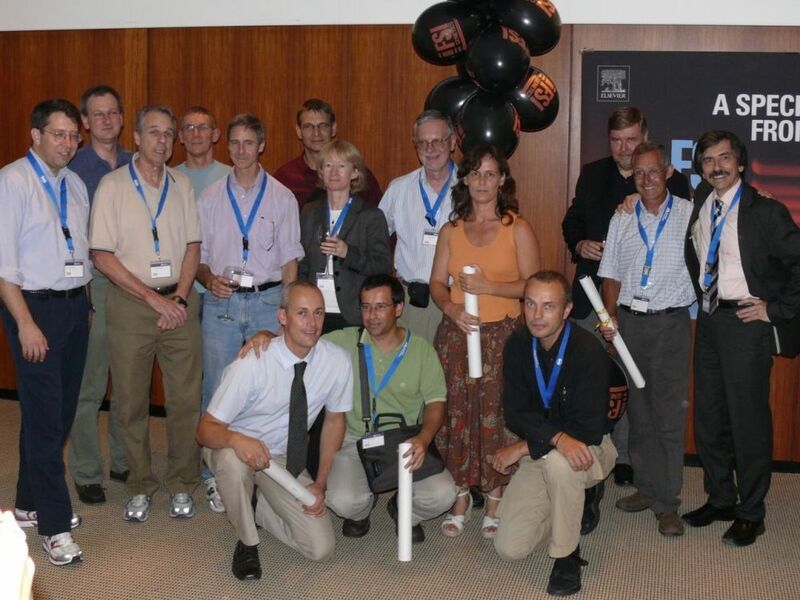 Furthermore, FSI Genetics has published an obituary for Konrad Hummel. with more details about his academic and private life. The Foreign Ministers of the Netherlands, the United Kingdom, Sweden, Belgium, and Luxembourg have signed a Framework Agreement on December 15, 2014, that grants a new legal status to the International Commission on Missing Persons (ICMP). The Framework Agreement stipulates that ICMP will establish its Headquarters in The Hague, where it will be close to other international organizations in the justice and rule of law field. This move, which is subject to further administrative and legal arrangements, is expected to take place during 2015. The basic level of the Proficiency Exercise 'Analysis of DNA polymorphisms in bloodstains and other biological samples' annually organized by the GHEP-ISFG and coordinated by the Quality Assurance Service at the Madrid Department of the National Institute of Toxicology and Forensic Sciences (Ministry of Justice, Spain) received accreditation by the Spanish National Accreditation body (ENAC) under the standard ISO/IEC 17043:2010. We are very grateful to the Excercise Coordinator, Koro Fernández, to the previous Coordinator, Josefina Gómez, and to all the staff involved for their excellent work and endeavour which have made this achievement possible. At the General Assembly of the ISFG members in Melbourne (September 4, 2013) during the 25th ISFG World Congress, the president M. Prinz announced that the Scientific Prize of the ISFG will be awarded to Professor Peter Gill (Oslo, Norway, formerly Glasgow and Birmingham, UK) for his outstanding contributions to the scientific development of STR technology. 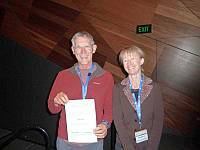 As prize winner, Peter Gill will give the introductory lecture at the 26th ISFG World Congress in Krakow, Poland, in 2015. Furthermore, Josefina Gomez Fernandez (Madrid, Spain) was elected by the General Assembly as Honorary Member of the ISFG. She has been a key person for the Spanish and Portuguese Speaking Working Group of the ISFG (GHEP-ISFG) and for organizing the annual quality control exercises. During the General Assembly, elections for some members of the executive board were held. Wolfgang R. Mayr (Vienna) announced that he will retire as secretary of the ISFG at the end of this year after serving in this position for more than 30 years. 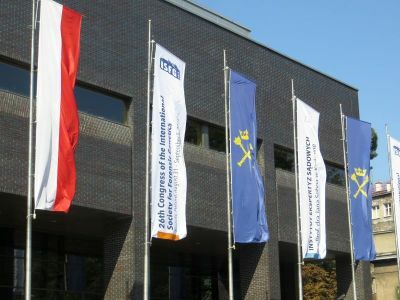 Mechthild Prinz (New York) was re-elected as President for her second and final term, Walther Parson (Innsbruck) was re-elected as Representative of all Working Parties, and Peter M. Schneider (Cologne) was elected as new Secretary. §2 (1): "The society aims to promote scientific knowledge in the field of genetic markers in the human genome as applied to forensic science. This is to be accomplished by scientific meetings of the society, formation of commissions, meetings of the working groups, and by scientific publications." §4 (1): "Any academic graduate, or member of the technical support staff, dealing scientifically with genetic markers, can apply for full membership." §4 (5, new section): "The membership is considered terminated, if the annual membership fee according to § 9 has not been paid for a period of at least two years." §4 (7): "The membership may not be used for advertising purposes. The Executive Committee can decide to terminate the membership if in spite of a warning this regulation is violated." §9 (2): "Membership fees are waived for Honorary Members. For supporting members the annual fee is set to be tenfold the membership fee for full members according to § 9 section 1." Herbert Polesky, president of the 13th International ISFG Congress 1989 in New Orleans, and former AABB president, recently passed away. He died suddenly of a heart attack in Punta Arenas, Chile on December 11 while on a trip through Chile and Argentina. Dr. Polesky is well known for his influential work in promoting safer blood products by advancing infectious disease testing. Additionally, he made significant contributions in relationship testing and the prevention of hemolytic disease in newborns. He also helped establish criteria for transfusion medicine training, helped develop the first board examination for transfusion medicine and was dedicated to education throughout his career. Herb Polesky was 78 years old. The ISFG would like to pay tribute to the memory of the late George Carmody (1939-2011). Dr. Carmody, a native New Yorker, spent most of his career teaching evolutionary biology and population statistics at Carleton University, Ottawa, Canada. He had a special interest in forensic DNA. During his tenure and after his retirement he trained and advised many laboratories, prosecutors, and defense lawyers across Canada and the US. He will be missed. An update on the "Nuffield Report on the forensic use of bioinformation" has recently been published online. The report addresses recent developments in using DNA databases, the storage of bioinformation taken from witnesses, victims and children, and the possibility of inferring ethnicity. The ISFG board has sent a letter to The Times to address the consequences of closing the Forensic Science Service (FSS) for the advancement of forensic genetic research in the UK. Sir Alec Jeffreys and Sir Edwin Southern are among the 33 signatories (see full text). The letter has already caused a strong reaction both in England, as well as internationally, as can be seen from the articles published by the BBC and the LA Times. 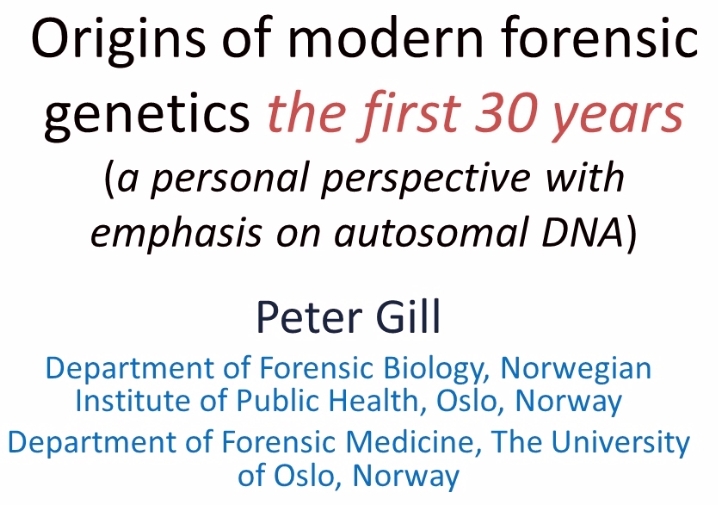 This BBC news video carries a statement by the chairman of our DNA commission, Professor Peter Gill (Strathclyde/Oslo). In a newspaper statement, Sir Alec Jeffreys said: "I would love to know a little bit more about the thinking, if indeed any thinking at all went into this bizarre decision, and whether that thinking involved any understanding whatsoever about the nature of forensic science and its importance in delivering justice." All ISFG members have now a direct and unrestricted link from the ISFG website to the journal FSI: Genetics. Members who have not yet registered for getting access to our website have to activate their personal profile on the ISFG website to use this service. Here you find instructions about the activation procedure. Registered ISFG members can use the FSI:Genetics link on the page Journal Access in the Members' Area. You can now pay your annual membership fee online by credit card (MasterCard and VISA). A secure link to a bank website has been added to your personal profile. 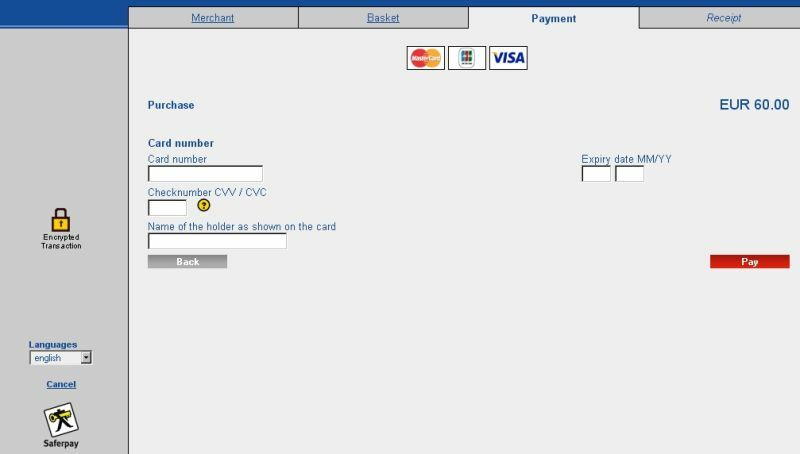 Using a simple "one click" button, you reach the secure payment site. After the payment, you will receive a confirmation of your payment by email, as well as a PDF document with a receipt and all payment details. To use this service, you must activate your personal profile. The first official impact factor has been calculated for FSI: Genetics by Thomson Reuters. The impact factor of 1.347 has been published in a re-release of the Journal Citation Report at the end of September. In addition, all publications beginning with Vol. 1, 2007 are fully searchable in NCBI PubMed. This will enhance the public awareness about the articles which have been published up to now in the journal, and will further stimulate the interest of colleagues to submit their manuscripts to FSI: Genetics. The executive board has published guidelines for the ISFG members to comply with the statutes of the ISFG. In particular, the use of the ISFG logo and the reference to the ISFG membership on a commercial website, and to the participation in proficiency testing exercises organized by one of the ISFG working groups has been addressed. During the 22nd ISFG Congress in Copenhagen, the successful launch of the new journal FSI Genetics was celebrated at a reception organized by the journal publisher Elsevier for the members of the editorial board as well as numerous journal reviewers who were present at the congress. Following the elections during the General Assembly in August 2007, the executive committee of the ISFG welcomes Leonor Gusmao as a new member. She will serve as treasurer, taking over from Niels Morling, our new ISFG president. At the same time, the board bids farewell to Angel Carracedo, who is retiring from the board after having served for 16 years. The official website of the ISFG has been completely redesigned. Following an extensive testing period, the new website has been transferred on December 23rd, 2007 to the server to replace the old ISFG web design which has been active since 2001.